This story of the animals having a talent show has a rhyming text full of fun and comedy. It’s good to see Macmillan daring to publish this book despite co-edition problems with rhyming text. There is some deliciously clever language and simply silly stuff, all flapping and clip clopping over the pages in a loud night of fun. I particularly loved ‘musical Meg sang an aria by Mozart while laying an egg’. 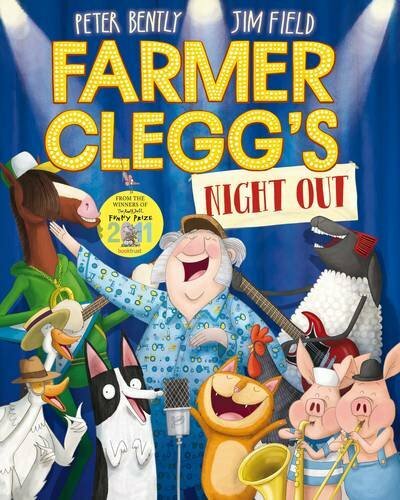 The fact that Farmer Clegg sleepwalks onto the stage and wins the trophy makes this a happy farm indeed and the mischievous twist of him believing he’s just slept through another quiet night leaves the reader with the last laugh. Confident and witty illustrations abound with energy and pizzazz, and contribute greatly to this joyful rumbustious romp.